She is envious because mermaids are sybarites. They don't do housework, change diapers, or tires on the car. You never see them standing in line at the grocery store because all they do is lie around looking gorgeous all day. A well known Canadian potter has written a funny, quirky memoir which stretches from her pioneer ancestors to the digital age. She underscores the funny side of what might have been disaster in a family with an alcoholic father in the forties and fifties. Her sister fed cat food on crackers to their mother, and her piano teacher was locked up for molesting his students. She invented Densa to protect her from the members of Mensa in her family. As an adult, she was married three times, had three daughters, and became a professional potter. Trips to Spain, Costa Rica, Baffin Island and Egypt are full of wry humour. On a visit to The Soviet Union, the trip leader bent all the spoons from the kitchen, Uri Geller style. This grandmother's memoir is full of funny stories, life philosophy, and attacks on the status quo. Mary wrote the book over thirty years, hoarding her ideas until she got a lap-top computer in 1990. Flattered to be hired as manager of a craft shop that year, she spent her spare time there writing her life story. The idea of turning her stories into a book was the result of reading Too Close to the Falls, an amusing memoir by Canadian Psychologist Catherine Gildiner. Publishing with Lulu was a decision to retain control of the memoir after a friend wrote about losing her husband in 911. Her publisher would not accept a book cover designed by her mother who was a professional book designer because the publisher had their own stable of artists. About the author. Mary Lazier lives in the country north west of Toronto. She has been a professional potter for over thirty years, focusing on porcelain hand-built table ware. 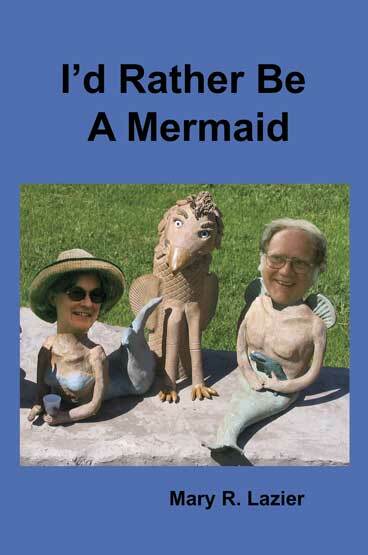 Recently, stoneware mermaids have become a passion, and her property is known as a mermaid sanctuary. Ali won “The Little Engine That Could” award at school for finishing the mini marathon at her school. She came in last, so far behind that her mother thought she must have been kidnapped along the way. At home, Ali said that she had noticed that the other kids had Dads at the school that day, and she needed a new step father. There were no likely contenders, so she decided that I should marry the cat, Captain Shadow. She officiated on the back porch. “I do” and “Meow” from Shadow. Thereafter, we were Captain and Mrs. Mary Shadow. He was a delightful husband. He always met me at the bottom of the outside stairs when I came home in the car. He hopped on my shoulder and amused the neighbours by proudly riding up to the house. “It is natural that people seek and marvel at the unknown. An adventure with mysterious and unfamiliar places and life forms inspires emotion, sometimes fear. Those people who overcome their fears and those who push their limits are richly rewarded with new and satisfying discoveries of the natural world. It didn't say anything about climbing 1200 feet vertically in a 4 mile hike: nothing about climbing two towers of 100 feet or the 60mph wind blowing up there. We were outfitted with harnesses which had huge clips to attach to a giant zip line. We also had gloves and a hard hat. From a platform, we were clipped onto the cable and pushed off into a cloud. There was a handsome young man at the end of the ride to catch each person so they wouldn't run into a large cement pole which suspended the whole thing. The game of “Catch the Tourist” should be an Olympic sport; 200 pounds times 25 miles per hour combine to make a mighty force. The young men said they climbed the trail three times a day, and ate rice and beans to keep in shape. I thought that the pictures from this adventure would make me the all time coolest Granny, but my grandchildren were much more interested in the picture of a big iguana sunning itself on the road. The rocks of Baffin are wonderful to paint. They range from soft warm brown sandstone, carved into voluptuous shapes by the wind and sea, to cold, hard sharp-toothed black granite. Some rocks, called “Erratics” are bigger than houses, and they perch precariously in odd places. Apparently, when the permafrost melts, huge bits of the mountain fall off. There are incredibly huge luminous blue-green icebergs floating in the sea, and miles of rolling tundra. Even though the landscape seems like the deserted barren bones of the earth, it is reassuring and peaceful in its simplicity. The tundra is beautiful in the fall. Tiny scarlet and yellow flowers contrast with the black and white moss and lichen.